KUALA LUMPUR, Malaysia — Has the “bossku” meme come close to bursting its bubble? Datuk Seri Najib Razak surely does not seem to think so. In several Instagram posts today, the scandal-plagued former prime minister milked the now viral “Malu apa bossku?” (Why the shame, boss?) to endorse T-shirts and hoodies bearing the phrase. Appearing alongside entrepreneur Mohd Nor Kharoni Kamisan and five other youths — all wearing said black shirts and hoodies — the men sought to introduce a new Najib catchphrase: “Bukan biasa-biasa”, or “not the usual” in Malay. “BBB!” Nor Kharoni, also known as Ron, called before Najib responded with the new phrase in a baby-like inflection. “Malu apa bossku!” they all shouted after Najib, in the video which has been viewed over 150,000 times and received nearly 1,300 comments. Ron was arguably the one who pushed the “Malu apa bossku” phrase into its viral status. The man was formerly known for his other ventures, including the Lepaking “hipster” food spot in Jalan Gombak, Aerox Clinica motorcycle dealership in Wangsa Maju, and the shop’s motorcycle racing team AC Racing. 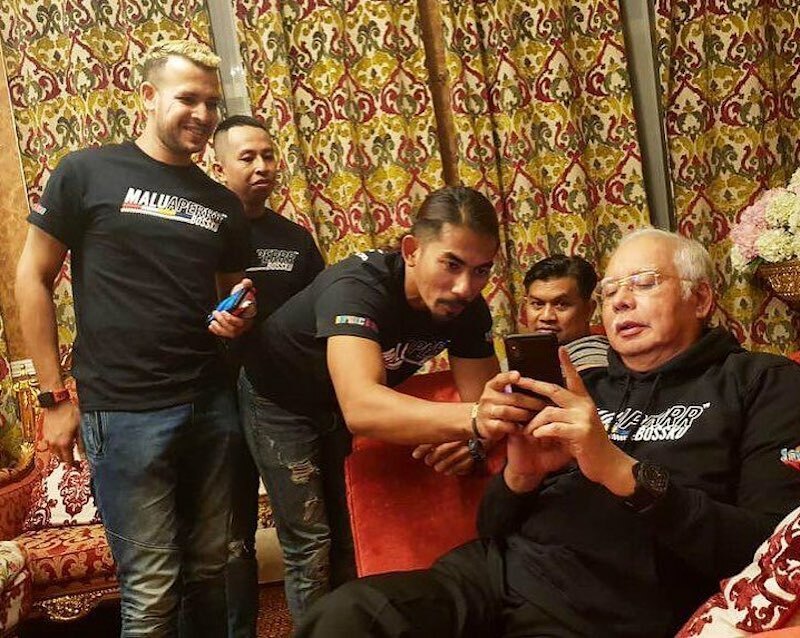 In a selfie video last month, Najib had obliged Ron after the latter called out “Boss kita!” (“Our boss!”), and the phrase has now not only turned into a rallying cry among the supporters of the Pekan MP, but has entered popular culture. Now, the self-made entrepreneur is hoping to turn Najib’s fame to cash. The T-shirts and hoodies with the “Malu Aperrr Bossku” brand are selling for RM49 and RM129 respectively. The brand’s Instagram account’s first post came just less than a week after Najib stole the attention of many blue-collar Malay youths for posing with the popular black-and-red Yamaha Y15ZR 150cc moped — with the plate number spelling 8O55KU, which read “bossku”. Najib has since used the image as proof of his newfound popularity as the people’s champion. Followed by nearly 16,000 people, the Instagram account itself is filled with photos of Malay youths, most of them men and moped riders, wearing the brand proudly. Najib also made his appearance in several posts. But Najib was not just stopping at shirts and hoodies. In another post on Ron’s account, the man who is facing several court cases linked to 1Malaysia Development Bhd (1MDB) also endorsed King’s Molten, a local brand of chocolate and coffee-flavoured milk. “Bossku… I hear there’s a story about a drink? Is it this drink?” Najib asked while pointing at a bottle of the brand’s iced coffee drink in his hand. The brand reposted the video, its caption poking fun at the recent endorsement deal gone sour among Youth and Sports Minister Syed Saddiq Abdul Rahman and local soft drink brand Hausboom.